As promised I have a sunscreen roundup series of everything I’ve tested over the past several months – 95 days to be exact. The sunshine here in Florida is stronger than anything I’ve experienced in California. Our first week here both Andrew and I got burned from being outside just a mere 5 minutes simply walking around our backyard. I immediately unpacked sunscreen bottles and sprays that I had brought with me from our move and we used everything up in a matter of a couple days because we sprayed it everywhere. After using everything up we began our search for the best formulas that weren’t greasy, didn’t have that sunscreen spray, felt long lasting and were the most effective at preventing burn and tanning. Unfortunately so far the only way to avoid getting darker is to stay out of the sun or be covered up entirely. Over the past three months we’ve put quite a few sunscreens to the test. This sunscreen edit is going to be split up into two parts: body and face. In gathering all the tubes we’ve tested, I found that there were around 25 different formulas we tried and we gave each one a thorough test run (with the exception of the tinted face ones which I tested but my husband did not). Both of us wished there was a formula that could be truly suitable for both face and body and while there are many formulas designed for multi-use, we’ve found for the most part we have to use separate formulas. Many bottles we used up entirely, mostly for the body. We each have our favorites which I’ll mention at the bottom. Then there are different types of sunscreen such as physical vs chemical. 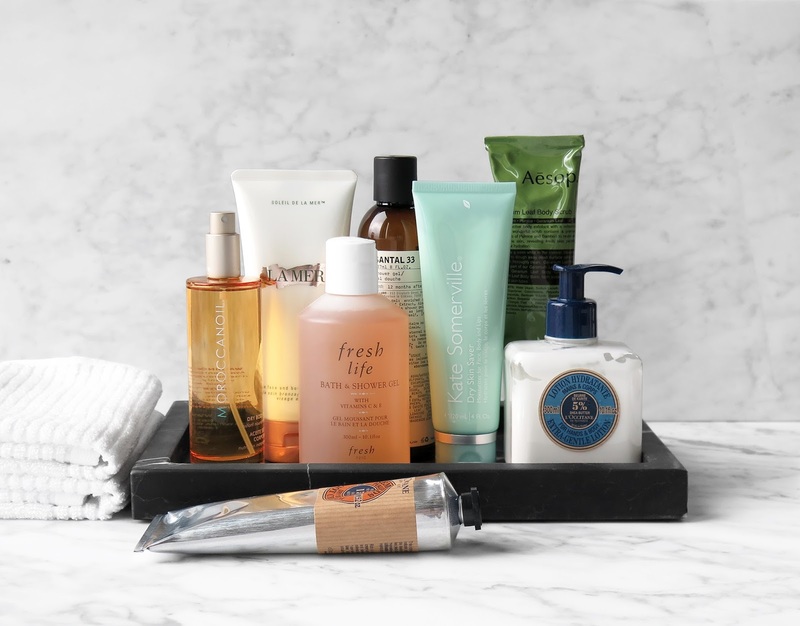 This site and this article help break it down, but still as one with super sensitive skin, I always proceed with caution. Many of my friends prefer mineral sunscreens (which are physical and chemical free) but I know some people have sensitivity to zinc oxide and/or titanium dioxide which are their only active ingredients. All that being said I’m still learning about sunscreens. We tested different formulas to see what lasted the longest and also how each formula felt on the skin. Traditionally I’ve found that I liked spray formulas because they are easy for me to apply on my own especially on my back. I’ve read mixed reviews about sprays and the biggest concern is that you don’t always know that you’re getting the proper coverage since product is prone to evaporation when you mist it before it hits the skin. With sprays we’ve both made a point to try and mist each other and give each area several layers to try and get as full coverage as possible. Up first are a mix of what we consider to be the longest-lasting formulas and then thoughts on some sprays. For body sunscreens it’s a must for me that there’s no white cast. I know many of them look white once you apply but the color disappears after a few minutes. In general the ones with a white cast tend to feel thicker and heavier on the skin. I wanted to see if I could find something that would be effective without being thick. Shown from above from left to right. Note that a number of these are water resistant with a time limit. I can’t recall the last time I’ve been in the water for 80 minutes so I can’t report on the time claims. But I will note which ones did the best in water. This is the latest from Supergoop! and I love this one. It’s a lightweight hydrating mousse that is long-lasting with a very light clean scent. It has a whipped texture when you dispense it and it’s easy to apply and blend into the skin. It contains Blue Sea Kale to provide antioxidant protection from heat rays, and shea butter, olive and avocado oils to keep skin hydrated. My husband felt this was too hydrating for his skin and for him since he sweats more in the heat this one felt a bit heavy on him but he does agree it lasts a long time. On me it was perfect. Both are hydrating lotions with the signature Moroccanoil scent but to me I detect a hint of licorice (which nobody else I know can smell in it so it must just be my nose). This is the most hydrating formula I’ve tried – these formulas have Argan Oil, Coconut Oil and Glycerine. Both the SPF 30 and 50 last a long time on the skin. For me I find them too heavy for every day normal use, I prefer them for the beach or outdoors. My husband on the other hand finds them hydrating but doesn’t mind the emollient feel. These have a super moisturizing feel and they do make the skin noticeably softer and helps with any dry patches or texture. The SPF 50 version noticeably helped prevent me from tanning a lot more than the SPF 30. This one is a spray that works on wet or dry skin, on dry skin I felt it was just ok. It adheres well but the drydown isn’t my favorite and it wasn’t quite as effective on me at preventing darkening. Re-application on wet skin however is another story and I wholeheartedly like this one on wet skin. For some reason I found it adhered easily on wet skin and worked when we went swimming in our pool and at the beach. Your mileage may vary on this one. This is one I’ve used up a number of times, it does have a slight alcohol scent but it’s a non-aerosol and the bottle says it has 35% less alcohol than other sprays although it does not specify which brands they are referring to. I find the misting dispenser to be really effective at applying product. I feel like it gives a more continuous mist which dispenses more product. I like this one because it’s non irritating, easy to apply and I can get my back without getting my hands greasy and spray those harder to reach places on my own. The only downside is that excess from sprays can get on the floor so if you spray inside the floor can get a bit slippery. This is both one of our top picks, we have tried a few other face sunscreens from Kiehl’s in the past and really liked them, for this formula they have both SPF 30 and 50. It’s a semi thick cream but is easy to blend, feels weightless, doesn’t have that greasy feel and has a good dry down. This lasted well in the pool and is completely fragrance/scent free. We found it really good at protecting the skin and since it has a lightweight texture it’s easy to reapply without feeling like you have layers of product on the skin throughout the day. I think I would 100% love this if it had a higher SPF. This is a light weight oil spray that has skincare properties to hydrate and nourish the skin and hair. It contains organic Indonesian Nyamplung Oil to protect skin and hair from the drying effects of sun, salt water and chlorine, senna extract defends from UV damage, Plane Tree extract fights free radicals. I really like the feel and hydration this offers. I rub this on my body and any excess on my hands I apply on the hair. It has a lightweight aloe almost honey-like scent that’s completely natural. The sun and heat can dry out the skin so I love that this is an oil that nourishes the skin. I need to invest in some of their After Sun Care like this After Sun Gel Ultra-Soothing product. If you have any good burn relief products you like that aren’t sticky let me know! This is another great sunscreen spray with SPF 50+ and it has no white cast. So many of you have raved and recommended Shiseido for sunscreens and I really think they have great formulas. However most of them have that white cast which I just detest. Many of you have said they fade after a few minutes and I think if you’re fair or light skin it does seem like it will disappear after setting. However on those of us with medium-tan to deep skin there’s still a contrast even with the dry down. Anyways this spray is completely clear. You can use it on both face and body but I prefer it on the body. It’s lightweight and has no greasy feel although it does have a slight hydrating effect with a glow. I found this to be very effective and long lasting in the water. 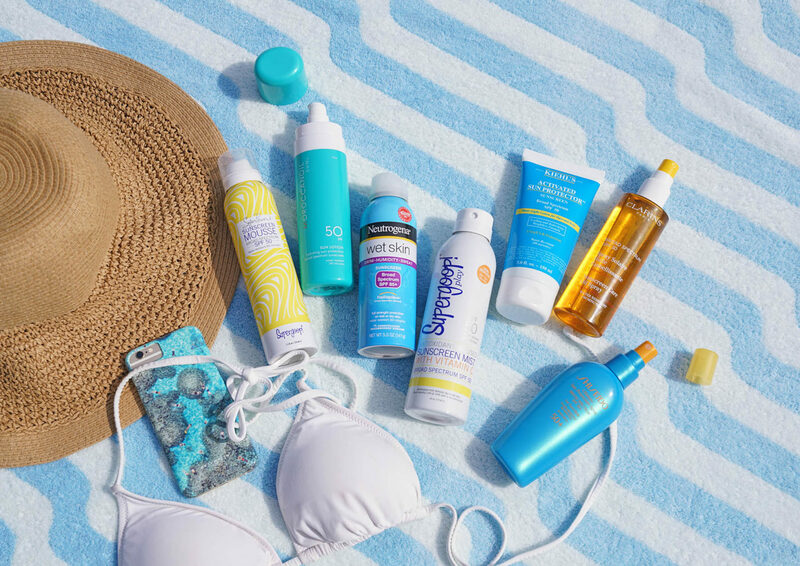 Up next are what we consider to be among the best non-greasy body sunscreens. At this point in our lives we’ve both agreed that we can live with a slightly greasy feel as long as there’s no hideous sunscreen scent. We are more conscientious about taking care of our skin. We have however found some great ones with no greasy residue. Shown same as the above photo because this is in the top pick for my husband in favorites for effectiveness at protection, preventing burn and minimizing tanning while still being lightweight, quick absorbing and suitable for both face and body. For me it’s in my top three for body. It truly is non-greasy, unscented and has a nice dry down. We really love Kiehl’s – this tube is completely used up, my husband loves it for both the face and body. We need to restock soon. This is in my top 3 for lightweight sunscreens. It’s oil-free for face and body, it is enriched with their Cellular Response Technology to preserve and protect the skin’s glow – and my husband even commented that my legs looked like they had a really nice glow with this on. Because it has a no-grease residue this is another good one for me to reapply every 2 hours and as the day progresses I don’t feel like I’m layering on tons of product. With this one I have mixed feelings primarily because it seems to have a lack of consistency. I bought a tube from CVS in store and then bought a multi-pack at Costco and while the product names are identical, the ingredient listing and order was not. I purchased them within a couple weeks of each other, both in Florida. I don’t know if one has a cheaper formula than the other or if they simply just changed it depending on distribution timing. This one has a creamy texture that’s semi thick but glides on the skin nicely. It does indeed have super sheer feeling finish but it’s not liquid so it doesn’t feel like it just dissolves on the skin. We both really like the formula, matte finish, long lasting effect. It did work to protect our skin – but as I’m already one who finds ingredients confusing, the difference in listings between the tubes makes me suspicious about quality. This brand has been recommended to me by friends and readers for years. It’s one I’ve wanted to try for a while but every time I see it in person I can’t help but be completely overwhelmed by the options! This one is actually for the face but my husband likes this on the body because of the lightweight feel and matte drydown. He feels this is one of the most effective ones for his skin and likes that if he sweats it doesn’t sting his eyes. We picked ours up from Blue Mercury but I’ve looked at the La Roche-Posay site and have been trying to figure out what to try next. If you have any specific recommendations please let me know what formulas worked for you. Because of the improved lasting power of so many of these we’ve found that we need to triple wash ourselves in the evenings with shower gel. Some of these really stick to your skin! If you have any sunscreen favorites for the body let me know in the comments. Any brand recs appreciated but if you can leave the formula name as well those are super helpful as so many lines have multiple formulas it’s so confusing when I’m at the store to pick one! Photo 1: Beach towel from Design Within Reach, Tray from West Elm, Bikini top from J.Crew, iPhone case from Gray Malin, sandals by Joie, hat from J.Crew and clear pouch from Truffle. Press samples include Clarins Sunscreen Care Oil Spray and the Supergoop! Sunscreen Mousse.